When planning your trip to Thailand, it is important to keep track of the major national holidays celebrated throughout the country. However, although businesses and government offices are closed on public holidays, tourist attractions and shops remain open to accommodate you. You should just be prepared to grit your teeth through traffic as these holidays brings about increased competition for travel and accommodation from Thais who use long weekends to get away from the big city. The beginning of the western New Year is a national holiday in Thailand, one of three “new year” holidays celebrated every year. Makha Bucha celebrates the Buddha’s first sermon in to his disciples. Chakri Day commemorates the founding of the current dynasty by its first king, Rama I.
Songkran is the traditional Thai New Year, generally celebrated as a water festival. 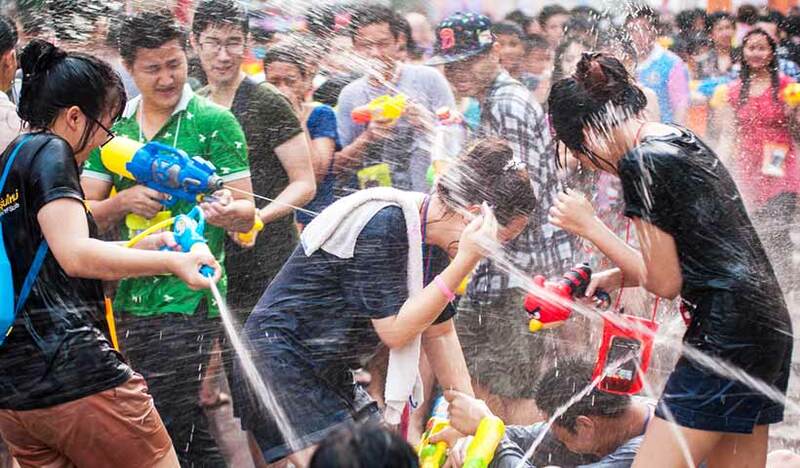 Be prepared to get wet all over as revellers abound, ready to soak you as a form of celebrating this season! International Labor Day is also celebrated as a national holiday, even though there isn’t much ado about it. Celebrates the day when the current king Rama IX was crowned in 1949. The holiest Buddhist holiday celebrates the birth, enlightenment and entry into nirvana of the Buddha. This day commemorates the Buddha’s first sermon and the founding of the Buddhist Sangha (monkhood) about 2,500 years ago. This day marks the beginning of the Buddhist ‘lent’ period, a time when monks are supposed to retreat to their temples while new life springs forth. Her Majesty the Queen’s birthday is a national holiday, also serving as the country’s Mothers’ Day as well. Celebration of the death anniversary of Thailand’s one of the most revered kings, Rama V.
His Majesty the King’s birthday is celebrated throughout the country and also serving as the country’s Fathers’ Day as well. Celebrates the date in 1932 when the country was granted its first constitution. The day before the Western New Year day is always marked a national holiday.